Think there was a mention in F/SN that ordinary weapons could not harm Servants, but when you bring prana into the whole thing (e.g., Kuzuki being reinforced by Caster), you can affect spirits. That would mean some of Kiritsugu's bullets... well, those ones are special, and if you're going to use them, then use it on the Master. I think some of your info is wrong there since modern day magic cant affect servants but that only applied to Saber only. Kuzuki's punches at Saber are buffed by Caster's reinforcement but thats a servants buff and not a humans. Rin and Shirou well, they got lucky since they fought servants with low magic resistance i guess. Soulshade wrote: I think some of your info is wrong there since modern day magic cant affect servants but that only applied to Saber only. Kuzuki's punches at Saber are buffed by Caster's reinforcement but thats a servants buff and not a humans. Rin and Shirou well, they got lucky since they fought servants with low magic resistance i guess. yea well being buffed by and servant and a human are 2 different things. thats why kuzuki can fight toe to toe with saber while kiritsugu had to aim the masters. As for rin beating up caster well, shes clearly not using magic, shes using karate or kung fu or some sort. Although it did say modern magic cant hurt most servants, doesnt mean u cant punch them. Wrong. She uses reinforcement from her jewels. Otherwise, you can't even make the Servant flinch when you punch him, as evidenced by Kuzuki punching Archer straight on the face. Last edited by Soulshade on June 12th, 2009, 8:54 am, edited 2 times in total. Soulshade wrote: yea well being buffed by and servant and a human are 2 different things. thats why kuzuki can fight toe to toe with saber while kiritsugu had to aim the masters. Kiritsugu did not buff his bullets in any way, except for those 'special few', which, as I already stated, would be better spent on the Master. And as for Rin beating up Caster, your assertion that she is not using magic flies completely in the face of the whole point of this thread - "Kiritsugu said that humans can't harm Servants". You might be right there. Then i guess to answer Sailerius' question Kuzuki got buffed by caster, Shirou, in HF gains archers arm to dish out the ownage but what about Rin and Shirou in the other 2 routes guys? The ultimate retcon... magicians and magi are not humans. Guns are human weapons, but magic/thaumaturgy/etc. are not human weapons. And uh... Shirou tends to trace swords which are NP class. Soulshade wrote: As for rin beating up caster well, shes clearly not using magic, shes using karate or kung fu or some sort. Although it did say modern magic cant hurt most servants, doesnt mean u cant punch them. You can punch them, yes, but you can't harm them with your non-reinforced punch. Not even a little bit. 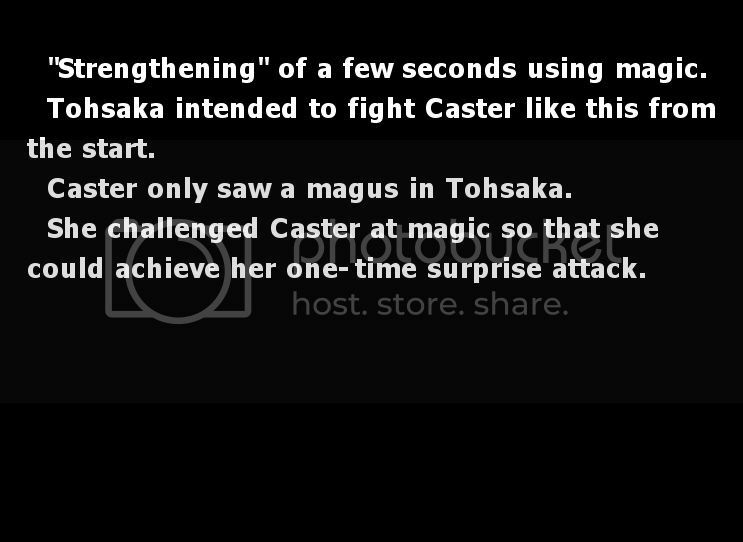 Well the thing with Caster in F/sn was she never learned hand-to-hand combat, but that's because during the Age she originated from there was no need for a backup plan. Although the present day magus needs a backup incase thier magics are not as effective as they hoped it would be. Also, it said with Kotomine's speach that a normal human can't harm a Servant, but that doesn't mean that a magus can't hurt a Servant at all. It just takes a certain type of skill/ability to counter a Sevant's skill/ability. because of the GARm at that time. As for UBW it was becuase GARcher decided to excellerate Shirou training to call forth UBW on his own. As for Fate well... he did assist Saber with a few moments, and managed to get lucky in the end of it all. Seeing as the thread is spoiler tagged, I won't need to use any. 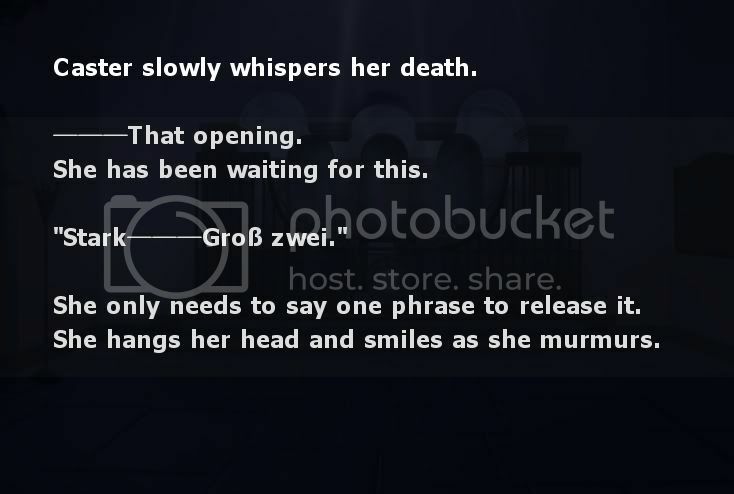 Fate: Shirou killed Kirei, who is human. Against Zerker, it was Saber who did the work, he just recreated the weapon. UBW: He learned UBW, which is a Noble Phantasm in its own right, and used Noble Phantasms to counter Noble Phantasms. Vs Archer, he was using Kanshou and Bakuya - Noble Phantasms. ReidE96 wrote: Seeing as the thread is spoiler tagged, I won't need to use any. I never thought of UBW as a Noble Phantasm in the strict sense, but hey, if Gate of Babylon is a Noble Phantasm, anything goes (What is GoB? It is just a wormhole that allows you to grab stuff, it is not even a reality marble). UBW is not an NP in the full sense, but it gives him access to NPs, even if they are just "trifling swords" as Shirou and Gil put it. Basically, it's generally magecraft, and doesn't count as a NP, since it's not a mystery that is associated with the hero(if something, then his NP is the ability to use UBW without restrictions, whatever that means - it is mentioned in his ingame bio). But is also treated as his NP, since it's his best power and he IS a legitimate HE, unlike Kojirou, whose greatest technique was reduced to a mere skill cuz he was a fictional hero. Basically, we can all treat it as a NP, cuz it's in the NP window and let's leave it at that. EDIT: I figured out what the "without restrictions" thing means! Since he is a Counter GARdian, his Reality Marble counts as part of the World, and thus doesn't get crushed by it. Which means he has unlimited time for it's use, unlike regular magi who can use it for a limited amount of time. SolarAdept wrote: EDIT: I figured out what the "without restrictions" thing means! Since he is a Counter GARdian, his Reality Marble counts as part of the World, and thus doesn't get crushed by it. Which means he has unlimited time for it's use, unlike regular magi who can use it for a limited amount of time. As a counter guardian, whether or not the World attempts to remove the Reality Marble is irrelevant, since he can maintain it indefinitely due to infinite mana. And, you are probably right, the counter force is treated as part of the World, so the World would not attempt to crush him. However, none of this kick in for him as a Servant, so he is still not a top-tier servant. Having inf mana doesn't help since the amount of mana you can put into it is fixed to what you use when you make it. He can't send additional prana to it whenever he likes.